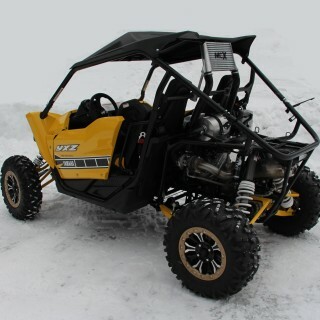 Yamahas 3 cylinder engine that is used in the YXZ 1000 is very suitable for turbo applications. 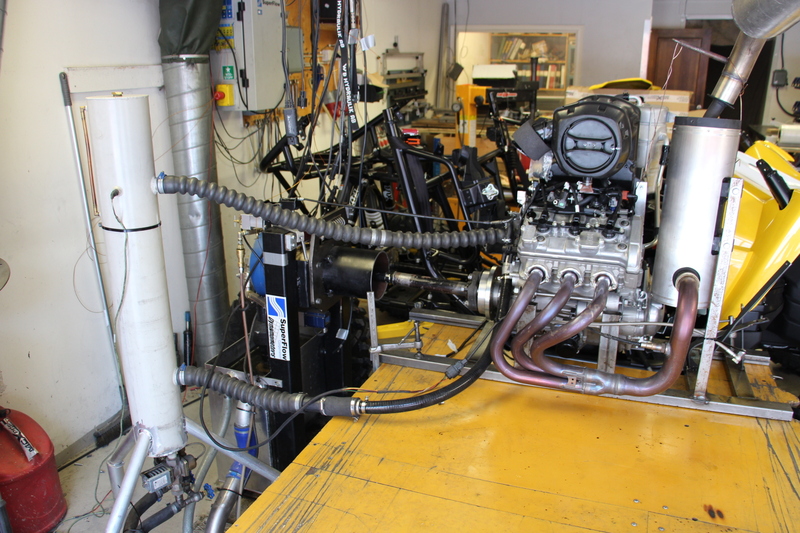 We have great experience modifing this engine, both as natural aspirated and with turbo. We got the confidence to build racing engines for team Yamaha Sweden 2006 and a few years forward for their snowcross snowmobiles. It became very successful, and thanks to this, we got the honor to build a lot of natural aspirated snowcross engines for team Yamaha USA to. But it is turbo we are most dedicated for. In January 2016 we sold over 3300 turbo kits to this kind of engine. 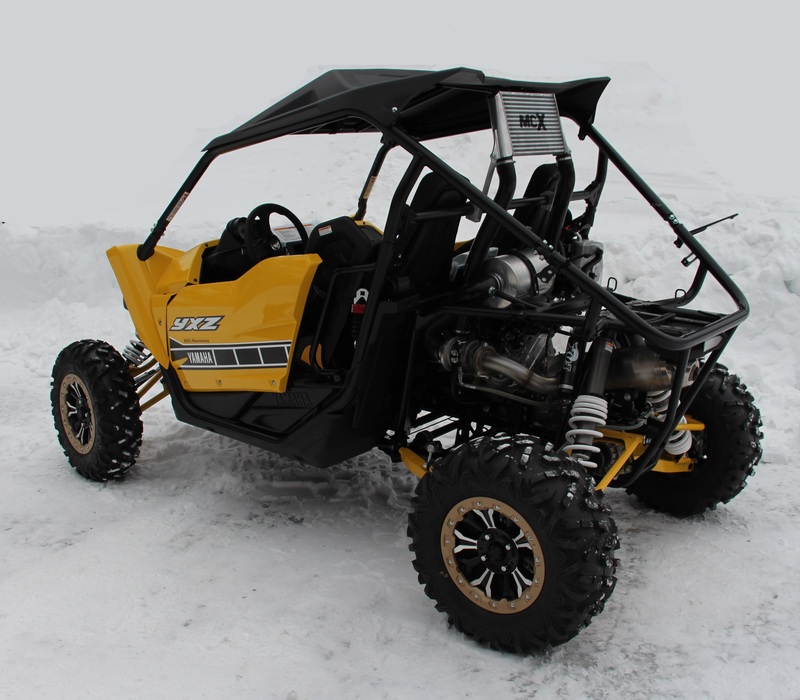 For us and for the UTV people that like speed and power it was great news when Yamaha desided to install this engine in the YXZ 1000. 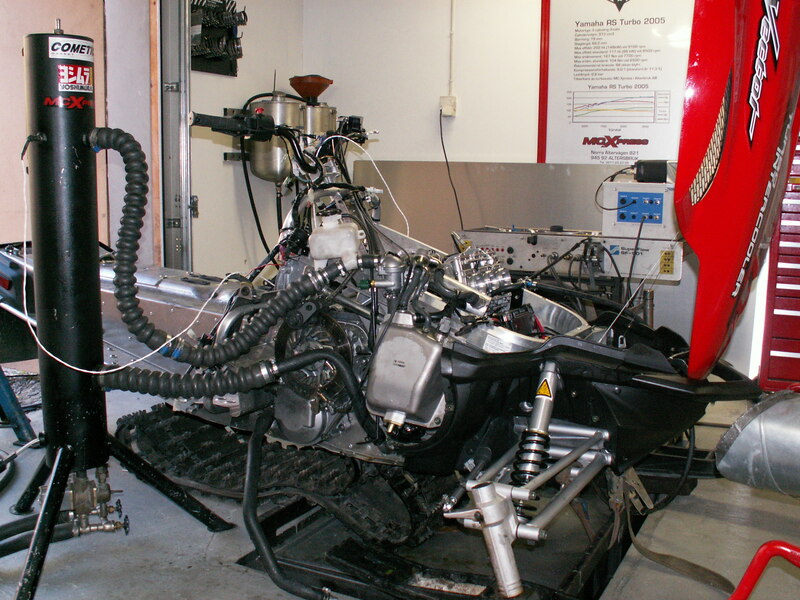 We have made a lot of tests with turbo on the Can Am Maverick and Polaris RZR 1000. These engines can handle up to about 180 hp with good reliability when using pump gas. The Yamaha 3 cylinder engine can handle much more power and still be very reliable. We will shortly have YXZ turbo kits ready for delivery. 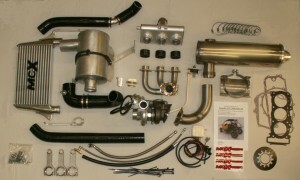 The priority during the development of this turbo kit has been durability and performance. What we found out very early when we made our durability tests was that the rods in the engine was to weak for turbo use. 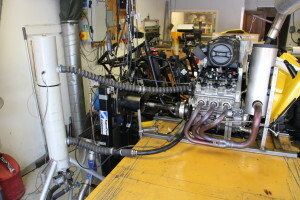 We made tests on several engines. 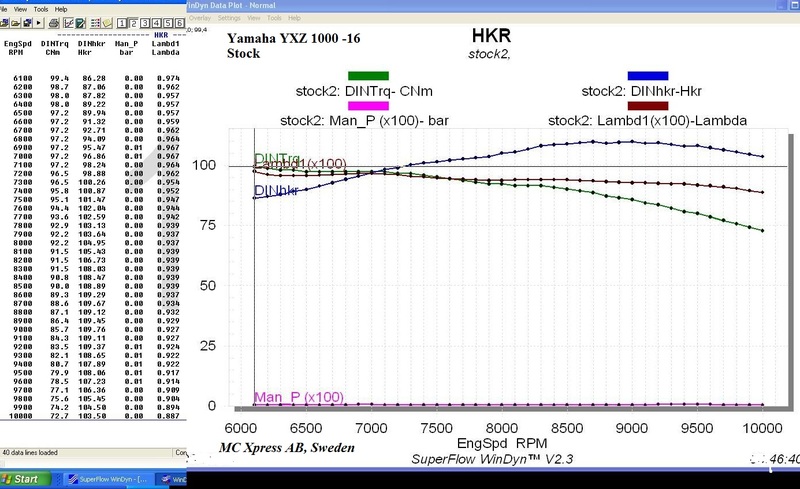 Already at 180 hp, the rods did break after a rather short period of time. We did not test lower than that. If the rods can stand for instance 150 hp, the safety limit is not enought in our opinion. That is the reason why we don’t offer any low performance kit to this model. With new rods, the engine can stand extreme performance. That is why we include new rods with this turbo kit. 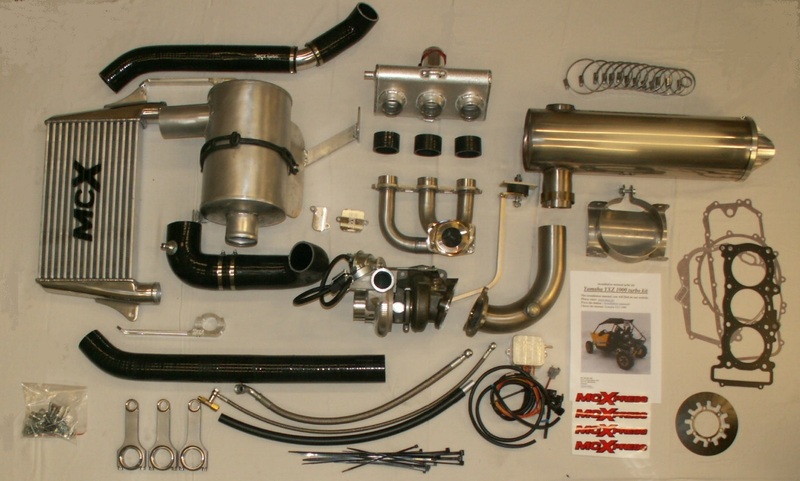 When we develope a turbo kit, we always consider how to install the parts. We spend a lot of time during the development making the installtion as easy and simple as possible. To get as high reliability as possible, we have only used high quality parts. This is something we know is very important both for our customers, the mechanic that make the installation and for us. We get happy customers and very few reclaims. The turbo we have used is the high quality charger TD04HL19T. We have not been able to find a turbocharger with higher performance to this engine when we are in the power range 250 to 300 hp. And we have tested many turbos during the years! The reliability of this turbo is outstanding. 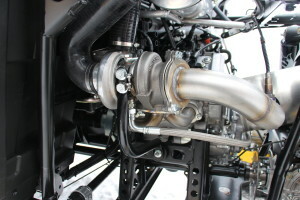 Both the wastegate and the blow off valve are integrated in the turbo. 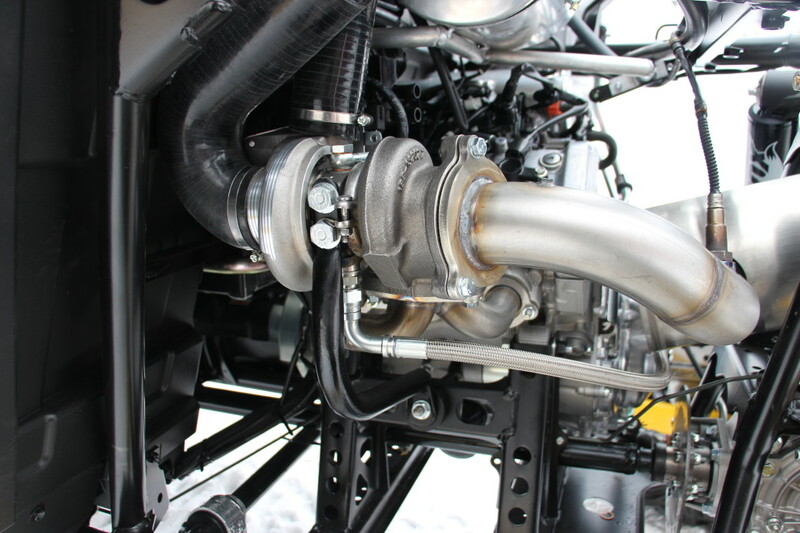 The configuration of the exhaust manifold is important for how the turbo system acts. 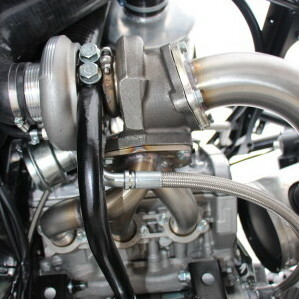 A long manifold will usually deliver high peak power, but the spool up time of the turbo can be slower. But the main problem with long primary exhast tubes when using turbo is the gas volume that will fit inside the tubes. When the engine hits the rpm limiter, it creates more or less exhaust bangs inside the exhaust. This issue can hurt the exhaust valves, and the result may end up in a major engine failure. 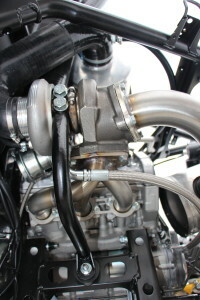 A short header will rapidly reduce the risk of engine failure. If the header is made extreamly short, the turbo spool up time will be slower and the peak power will be less, so that is not an option either. On many vehicles, it is not possible to choose the most perfect turbo location because there are no space, but on the YXZ turbo, is is plenty of space to put the turbo exacly in the best location. And that is what we have done. The air filter setup is very important for the life time of the engine. We have choosen a large air filter that is easy and fast to replace. 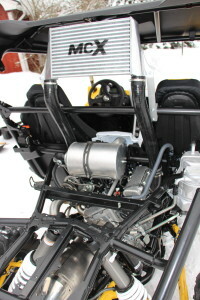 The air intake to the turbo air filter is in the same location as the stock Yamaha air intake. 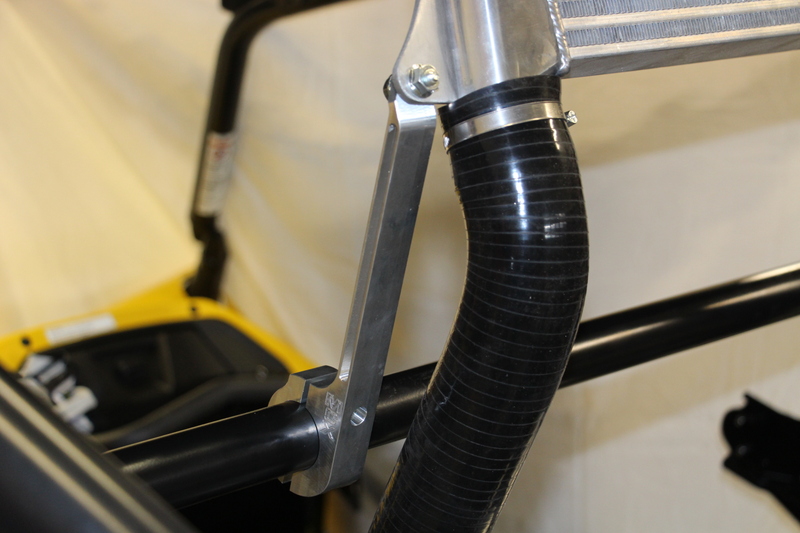 The clean air that has passed the filter is lead down to the turbo through a large silicone hose. When driving i very dirty conditions, it is possible to place a pre-air filter before the actual air filter. When the air pass the compressor of the turbo, it gets hot. A modern turbocharger has very high efficence, but you can still expect that the teperature rises about 100 degree C at 100 kPa turbo pressure. This temperature rise is not what you want. That is why an intercooler is used. 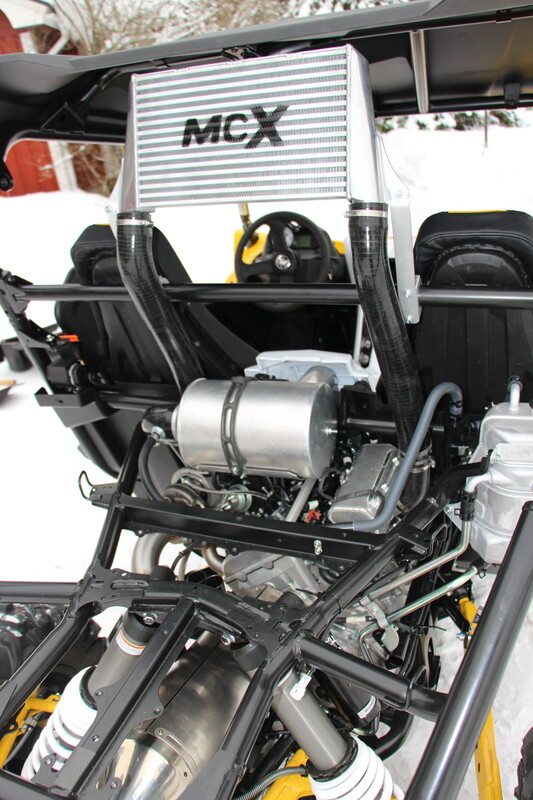 With an efficient intercooler, you can expect both higher performance and better reliability. If it is possible to install, an air / air intercooler is normally the best choice for a normal vehicle. But to get best possible efficiency of the cooler, it shall be placed in the air stream from the speed of the vehicle. Our intercoor has very high efficiency thanks to the size and the location. The development work with the turbo kit is very exciting. This is the best part of our job. We spend a lot of time testing out all the componenets, so we are sure we offer the best possible setup. To begin with we test the engine stock, so we know what we have to deal with. 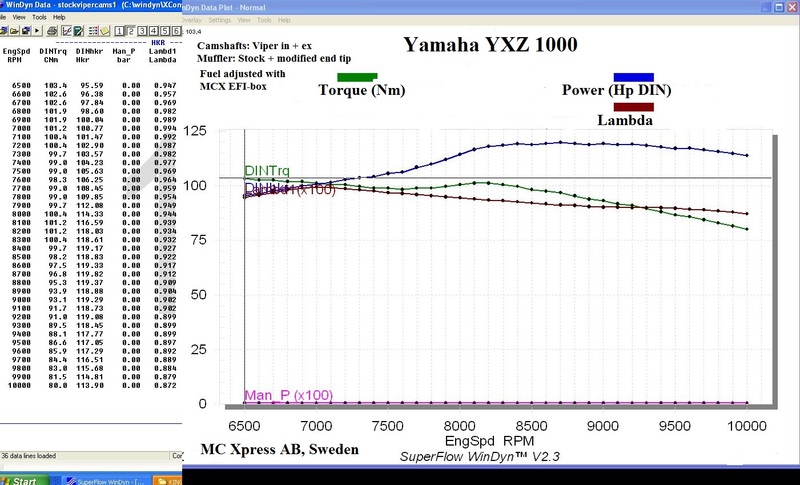 The stock power on our YXZ 1000 was 109 hp. Yamaha claim 111 hp so this was what we expected. The end cap in the end of the stock muffler is very restrictive. We tested to install a much larger end cap, and then we got 113 hp! After that we removed the complete muffler, but the power stayed the same. 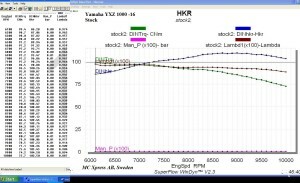 Stock v/s Turbo engien tested in the dyno. The camshafts on the YXZ has much less lift and duration compared to the Viper -16 snowmobile cams. 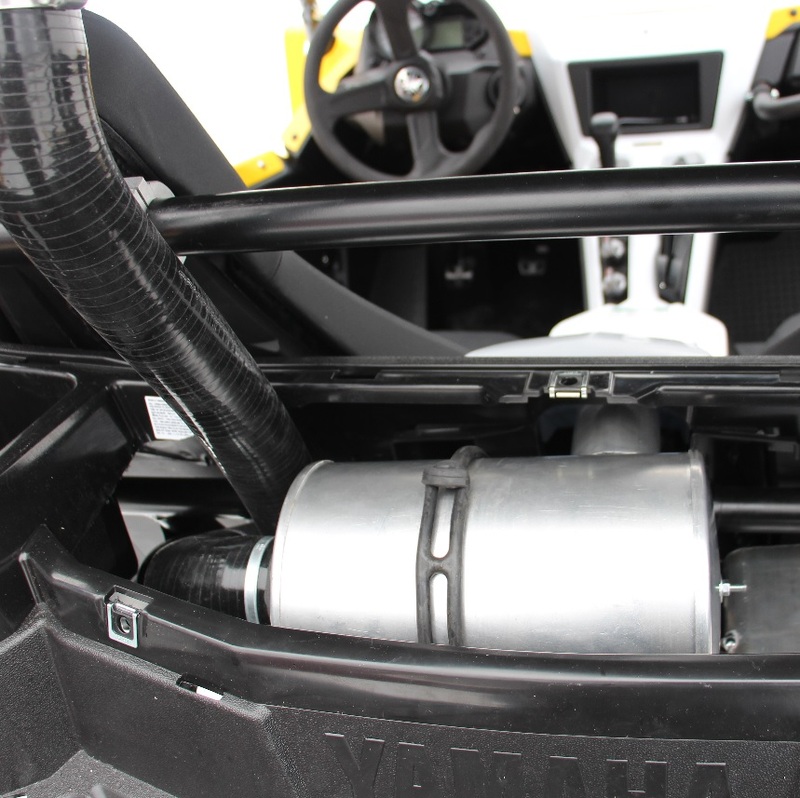 We had to try the YXZ 1000 engine with the Viper intake + exhaust camshafts just to see the difference. The power went up to almost 120 hp. 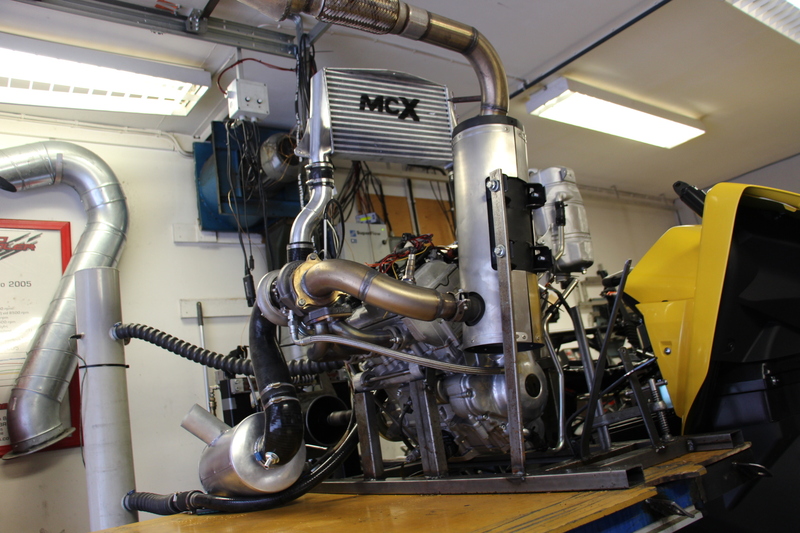 We added some fuel to the stock injectors with our MCX EFI-box. 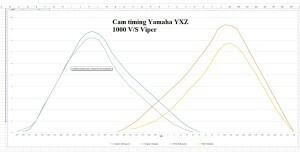 We also tested to drive with the Viper intake cam + the YXZ exhaust cam. The power then went down to 118,5 hp. We installed a 2 mm cyinder spacer to avoid detonation, adjusted the cam setting to the stock lobe center (The cams rotate a few degrees when installing a cylinder spacer). 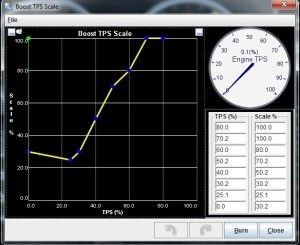 After testing different exhaust pipes, mufflers, and some different plenum sizes we started to get really good results! Normally you can expect to double the power and torque at 100 kPa turbo pressure if the turbokit is well designed. When using the Mitsubishi 16T turbo, we usually gain sligthly more performance. But in this case, we gained much more. At just over 1 bar turbo pressure, we passed 260 hp! This was better than expected! That is one reason. The big air filter is another. And we know from earlier that the Mitsubishi 16T turbo is a perfect choise for thei engine. We also use extra injectors in the plenum. We have seen that this setup is very efficient. Plenum on top of the throttle body. 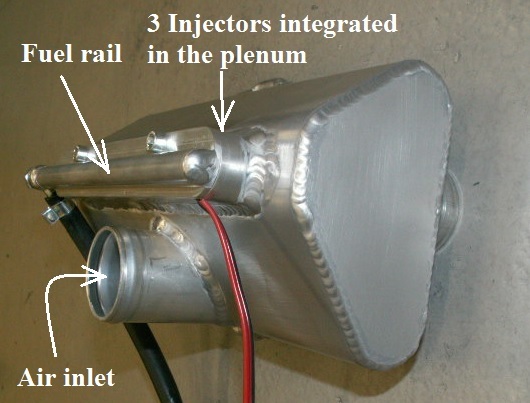 The plenum size and how it is made is often very important for the performance of the engine. 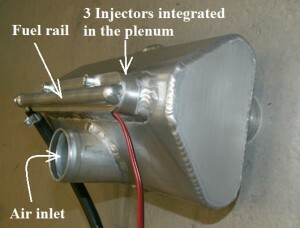 We have been very surprised many times when we tested out different plenums. 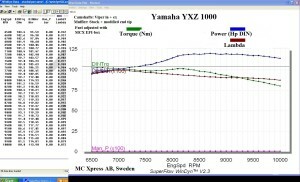 The YXZ plenum size does not need to be very big we found out after testing some different ones. When installing a turbo, the engine will need much more fuel. The stock injectors are designed to handle just slightly more fuel than the stock machine needs. Either the stock injectors needs to be replaced by bigger ones, or extra injectors must be installed. We have tested this back and forward many times on differeint vehicles. 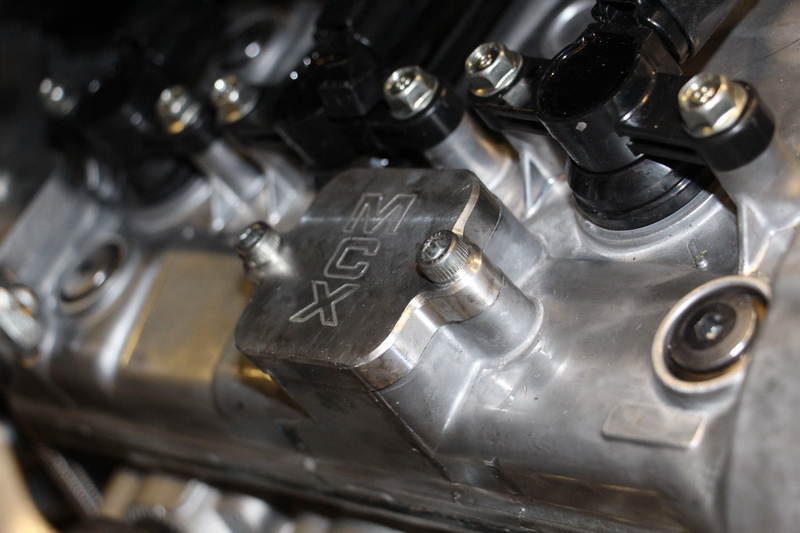 On the YXZ 1000, we find more benefits with installing 3 extra injectors in the plenum. When driving slowly and on idle, the engine runs nicer with two normal size injectors / cylinder compared to one big. 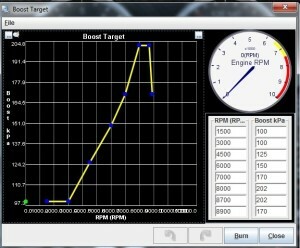 And the vaporizing of the fuel is getting better at high rpm when the injector is far away from the intake valves. 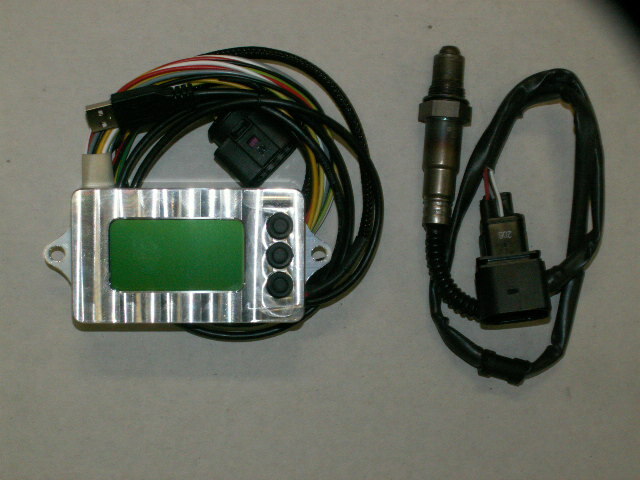 We developed our first generation of EFI-box 1999. The EFI-boxes has become more and more advanced during the years. The last 4 years, we have used the 5:th generation of EFI- box. This last version is very reliable and it can control a lot of interesting things. 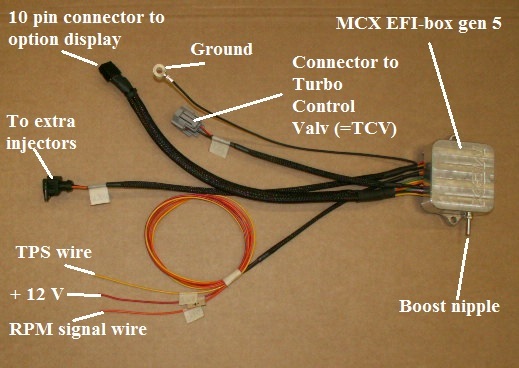 Thie EFI-box is specially designed to be used on turbo engines with fuel injection. It controls either the stock injectors or extra injectors. On the YXZ 1000, it controls extra injectors. When climbing up in altitude, the MCX EFI-box automaticly compensates for the thinner air, so the power maintain the same. To get the best drivability possible, the turbo pressure depends on the rpm and throttle position. Maximum boost at for instance 6000 rpm may sound like a nice idea, but the risk of detonation is much higher at low rpm, so we normally adjust down the pressure a little at lower rpm. At higher rpm, the detonation risk is less, so here we can turn up the turbo pressure. This make the torque curve very flat. But before the engine reach the rpm limiter, we adjust down the turbo pressure so the power curve is turning down before it reach the limiter. When driving fast at part throttle, the turbo pressure is normally rather high. It is better with less pressure at this point for the fuel consumption and for the throttle feeling. If you would like to do your own adjustments is is possible to buy a program license. Then you can do your own personal fuel and boost adjustments. It is for instance possible to do datalogging with a PC when using the Tuner Studio program. 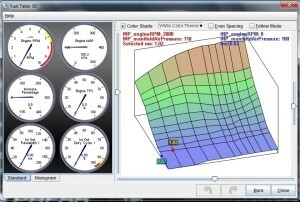 The fuel curve can be adjusted depedning on manifold air presure and rpm. The boost pressure can be adjusted depending on rpm, baro pressure and TPS. If you want to make minor boost changes, it is possible to change the numbers in the map ”boost target” map. 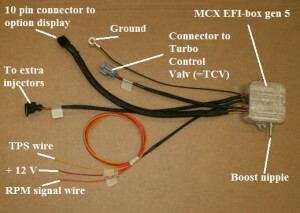 The the 10 pin connector, you can install our display and log unit. This display is sold as an option. The display will show lambda value and A/F ratio, turbo pressure, rpm, baro pressure, battery voltage, TPS and many more things. The display can also do datalogging 10 times / second. This display is a very nice tool. We can also offer a blue tooth unit. 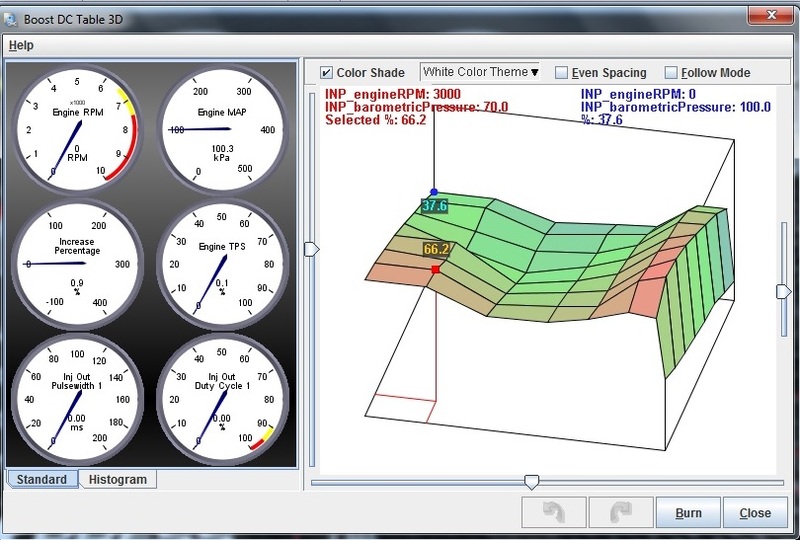 It makes it possible to wireless adjust the MCX EFI-box, or use an android phone or tablet as a display. Vi kommer inom några dagar att lägga ut mer information angående effektkurvor och vår avancerade motorstyrning.